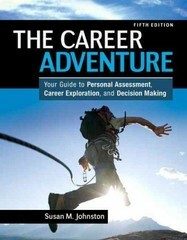 Career Adventure, The: Your Guide to Personal Assessment, Career Exploration, and Decision Making 5 Edition This book leverages the power of peer and mentor support guiding students through a flexible, yet comprehensive, approach to career planning in a world in which change continues to influence the career landscape. The Career Adventure is a full-range approach for adult students who are seeking engagement in a systematic process to career decision-making. Whether students are new to career planning and trying to determine how their experiences prepare them for future careers or seasoned pros who are moving on to a new career opportunity, a series of steps helps them build on the growth and learning that has informed their prior work lives. Students will use their experiences as part of a process that contextualizes skills, knowledge, and background to inform future success. Grounded in ‘doing’ rather than ‘explaining,’ students are encouraged to move aggressively through these steps for life-long career development. The revision focuses on setting and achieving career goals that offer long-term growth, and uses social networking media to create a vibrant exchange that supports mutual value and meaning. The opportunity to capitalize on the knowledge of fellow career seekers maximizes information sharing and reflection for better, more illuminated goal-setting and decision-making.